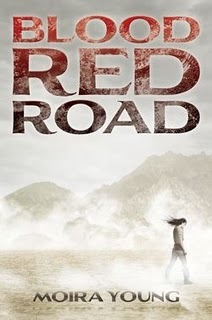 There is something quite calculating about Blood Red Road and the story of Saba from the Dustlands. Take a pinch of Hunger Games, a peck of Gladiator and a major sniff of The Droughtlanders, add a dash of Mad Max and The Road and you have an explosive cocktail to play with. Moira Young (a former Canadian Actor) has carefully blended all the dystopian genre has to offer and certainly hit target. Blood Red Road is violent. Saba is super tough and Em is wiley for a nine year old kid. Saba has to fight, or they will kill her little sister. If she loses more than three fights she will be killed herself. Saba doesn't intend to lose a fight and quickly acquires a reputation that brings in the blood lust crowds. The crowds also fear her weird crow that attends every fight.